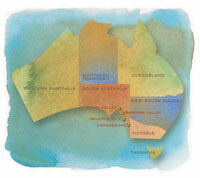 The changes in the NSW wine industry over the past two decades have been monumental. It's not just about the Hunter Valley anymore, although excellent wines continue to issue forth from this legendary region. Some big players still dominate NSW production, McWilliams 'farming' the Hilltops region, Hardy's throwing their lot into the Canberra District and de Bortoli producing excellent expressions across a range of varieties from the Murrumbidgee Irrigation Area. But it's the lofty little spots hugging the western side of the Great Dividing Range that are causing the ripples with their tipples. Orange, for example was described last year by wine guru Max Allen as 'Australia's most exciting'. The altitude cools the scorching summer temperatures, nearby Mt Canobolas provides rich volcanic soils and having the longest ripening period in the whole country ensures beautiful, deep flavour development across the key varietals.